Tyrannosaurus Rex and not only refers to a prehistoric creature, but a man from Nebraska who succeeded, after a series of legal proceedings, called as the dinosaur. Tyler Gold was until recently the subject's birth name, who during a recent hearing explained that the reason that led him to decide to be called Tyrannosaurus Rex was due to his work as a scenic artist. 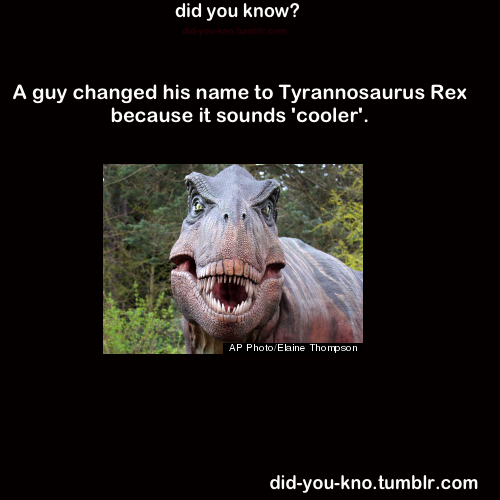 Thus, Tyrannosaurus Rex ruled to be running from the law with its new name and said that 'as an artist, it is important to have a name that is recognized and memorable'.